Early on in my professional life I was introduced to the world of entrepreneurship and as I started my first business at 24, Forever Young Inc., I soon wrapped my identity around being "an entrepreneur". But what does it mean to be an entrepreneur? What I came to learn is that entrepreneurship is really about wonder and problem solving. It's about being an expert sleuth, constantly looking for problems worth solving. It's about applying systems and design thinking to engineer the minimum viable product or MVP as a start to solving that problem. And perhaps most importantly, I learned that entrepreneurship is about putting ego and crazy ideas second to real people and real challenges. Sometimes real problems require crazy ideas. But most problems, if approached with humility, can be solved with elegant solutions. With this profound knowledge, the following is "my stake in the sand": I strive to be the best thought partner I can be; to collaborate with the people most impacted by challenges worth solving; to thoroughly research and test solutions; and to genuinely evaluate progress. I will continuously seek to place my finger firmly on the pulse of whether we are achieving what we hoped to achieve. And if what we intended isn't working, I will pivot. Always nimble and iterative - I will strive to refine solutions and products to continuously meet the needs of people and the challenges they face. All entrepreneurs have to wear multiple hats. But the strategic entrepreneur knows that half the battle is honing what she is good at and delegating authority to others to help shape and build a vision. And that speaks to leadership. The following is a quick story that demonstrates my entrepreneurship, thought leadership and design thinking skills but also shows my willingness to let a great idea flourish and grow way beyond the initial MVP to something I never imagined. One of my areas of expertise, and clearly a huge professional passion, is using human capital development as a driver to scale change across large organizations. Things don't scale change. People scale change. Having served in a variety of roles as an educator, I often encountered a problem I considered really worth solving - the dreaded Train-the-Trainer model (TtT) or as I call it, "one-and-done, good-bye and good-luck" professional development. While serving as Discovery Education's very first Director for Professional Learning, I came across a superintendent who sincerely wanted to drive change in a district that characteristically made decisions school by school. Like so many districts I have worked with across the US, this superintendent and his team were struggling to implement the Common Core Standards. Serving as a thought leader, I sat down with the superintendent's leadership team and together, we broke the problem down. We talked about TtT - why doesn't it work? Is it the model of PD or is it us or is it how we implement it or fail to implement it? And then we talked about what would happen if we dared to do something else. We wondered, "If not TtT, then what should a more progressive professional learning model look like and what should it feel like to the stakeholders it's intended to serve and more importantly, how will this new model serve our students? Around that time, I had just finished devouring a book titled, Professional Capital, by Andy Hargreaves and Michael Fullan. Hargreaves and Fullan break down Professional Capital into three chunks: human capital (the talent of individuals); social capital (the collaborative power of the group); and decisional capital (the wisdom and expertise to make sound judgements about learners - cultivated over many years). No doubt, Hargreaves and Fullan never intended for their ideas to serve as the antedote to TtT but that's how I interpreted their ideas and swiftly went about using some of their basic concepts to reimagine and create a system of professional learning called Teacher Leader Corps to solve the problem of the dreaded Train-the-Trainer. The original MVP of the "Corps" model was beautiful, nimble, elegant and simple. Using design thinking principles, it was a solution built on the fundamental belief in nurturing and growing capacity in people. But Teacher Leader Corps, and all it has come to be, required hundreds of people collaborating towards common goals. It takes a village to raise a change movement! And that's the moral of the story. Once the fundamental components were set, the system began to morph in the image of each district and the people it needed to serve and the problems it needed to solve. The coolest thing about being an entrepreneur and architecting a solution like Digital Leader Corps, is having the guts to stand aside and watch in awe as my peers and district partners ran with it. The original Teacher Leader Corps model has since served Discovery Education's professional learning department to drive the effective integration of it's digital content solutions across the world. And since I started with the organization nearly ten years ago, Discovery Education's Professional Learning division has grown to over 30 million dollars in partnerships annually. Professional learning is now nearly half of Discovery Education's total annual revenue, which is a big deal considering Discovery Education's main product is digital content! noun. Somebody who views the world differently. Urban Dictionary. Forever Young, Incorporated, which designed, manufactured and distributed two product lines for children, was my first foray into entrepreneurship. Baby Face Bedding was the first line of 100% cotton bedding in primary colors offered in the US. The line went national within six months. Little Lady Lingerie and Big Boy Boxer was the first line of 100% cotton "underwear that's fun to wear" for children sold to retailers such as Nordstrom's and Neiman Marcus. Owning and operating a Harley Davidson Dealership is like being the mayor of the town. Not only did it involve managing a huge brand and retail experience, the dealership also served as a community hub for fundraisers and other charity events. While managing the dealership, I had just begun a masters degree in education. A superintendent in a neighboring district often asked me to substitute teach for a particularly challenging group of kids. I'd ride one of our big Harley's down to the school and roar the engine before I parked so that this rowdy bunch of students I was about to teach would be sufficiently impressed. I substitute taught for those kids at least twice a month and we had a blast. Smart superintendent! As a business, we were able to move the dealership to a much better location and increase our allocation of bikes by 100%, an effort that is critical for a dealership to grow and increase in value. The dealership was eventually acquired by Harley Davidson of Los Angeles. DealerAddendums.com is a SaaS platform that allows car dealerships to create, print and manage their addendum labels. For over a decade, my husband and I have experimented with various platforms for car dealerships. After really learning the business and forging relationships with various dealers, the problem general managers really needed us to solve was the automation of addendum label production, an otherwise time sucking and laborious practice. DealerAddendums.com's system automates that process in yet another elegant and simple platform, and our system is patented. After having been in the manufacturing, service and retail space, SaaS platforms that automate otherwise laborious tasks, is the best business model I've been involved in yet! Responsible for the largest partnerships at Discovery Education, I work closely with district leaders as a thought partner to design, implement and evaluate change movements that impact thousands of educators and millions of students. . The architect for Discovery Education's award winning Leader Corps system for professional learning, I have designed meaningful professional learning focused on building the capacity of individuals and groups to reach commmon goals. Taught by the best professional development designers I have ever encountered, I have over twenty years experience designing highly customized professional learning for a variety of goals and on a variety of topics. Beginning with the end in mind, I have worked deliberately with Discovery Education and our partners to assist them in designing appropriate evaluation criteria and systems for measurement of success. No one wants the "fox in the hen-house" telling the story. Instead, we strive to identify what indicators tell that story and then assist in collecting data and artifacts to engage in a deep analysis of the work and discussion around what evidence suggests we are making progress and where do we have gaps and need to pivot and iterate the work to best support the adult learners we serve. .
At Discovery Education I have had the opportunity to lead conferences and professional learning with superintendents and their leadership teams, principals, coaches and teachers. One of the more popular events I design and lead at Discovery Education is a bi-annual event where Chief Academic Officers from around the country come together to share their work and discuss problems of practice. This event is hugely popular and many of our CAOs have since grown professionally and even become superintendents because of the connections and learning garnered at these events. . 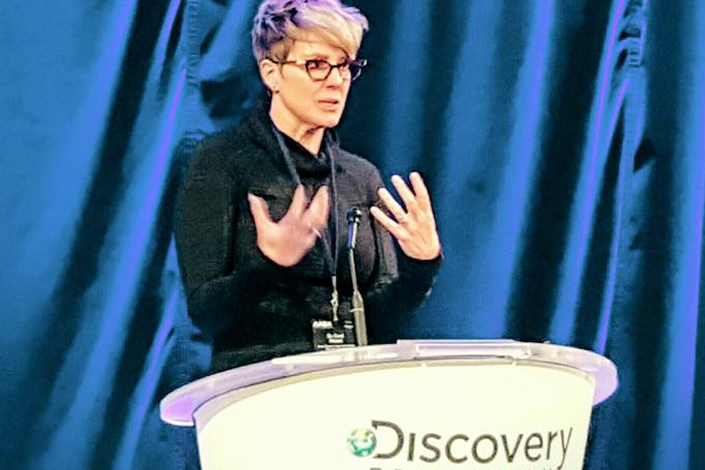 Particularly talented at engaging a crowd, Discovery Education has afforded me the opportunity to hone my skills as a public speaker and panelist. Given professional learning and change management are two areas of expertise and passion, I am often asked to represent the organization at a variety of conferences around the country. At Discovery Education I led the original professional learning team and for the past six years and now, I lead a specialized team that serves large urban and suburban school districts. Serving as a Senior Director, I support our sales directors and managers in their development to effectively represent our products and professional learning services. A top performer and "uber consultant", I assist team members in reaching their sales goals by attending partnership meetings, engaging in deep gap analysis with partners, and designing solutions that best serve the partner's needs. Under my direction and leadership the Discovery Education Professional Learning Division has grown from 250K in sales to 30M in sales annually. The increase in sales of professional learning is in large part due to my efforts to move Discovery Education away from selling "days" of PD to offering comprehensive systems of professional learning involving deep coaching of stakeholders. Interestingly, I believe I still hold the record in terms of the largest sale of our Techbook products - but DE Team members are right on my heels, which is a good thing! Nearly ten years with Discovery Education, I initially served as their first Director for Professional Learning, helping to grow the professional learning department from a mere blip of business to now over half of all Discovery Education's business. I am the sole architect of the original Teacher and Digital Leader Corps framework, the first system of professional learning adopted by Discovery Education. Currently I serve on a team that works exclusively with large urban and suburban school districts, districts that characteristically cope with challenges of skill and other capacity gaps. Working as an uber education consultant with my team, I work with district leaders as a thought partner to help them design, execute and evaluate change movements. At Pearson Digital, I had the distinct pleasure of working with Debra Kerr, SVP for Pearson, to help facilitate the marketing and story-telling of her region's work with districts implementing digital tools. Along with other duties such as interfacing with state level leaders, lobbiests and representing at education conferences, the core of my work with Debra and her team was to create and provide marketing tools for her team. The challenge Debra's team was encountering, was providing the path and tools necessary for districts to implement the products as designed. Many of their districts were frustrated because they weren't getting the results they anticipated when using Pearson's digital tools. The team needed a better way to show districts the potential of these products if implemented as intended. Working with a production crew and a Pearson data specialist, I produced several digital case studies of three districts implementing with fidelity. Debra's team was then able to show prospective districts how to implement their tools to achieve results through the lens of their district peers. These marketing pieces also served to celebrate the work of districts implementing with fidelity and getting results. A win-win all around! Serving as a project manager for large implementations of The Princeton Review's digital assessment tools, I ensured that all projects went well from beginning to end. I managed the professional development implementation to the technology deployment. Communication and relationship building were critical to the success of these implementations because educators were understandably resistent to testing let alone, online evaluations where there were many challenges with Internet connectivity, old network systems, and complicated interfaces. I managed and trained professional developers supporting projects and often conducted professional learning so that educators could make meaning from the resulting data and inform their future instruction. Education is a second career for me. While managing the Harley Davidson Dealership in Santa Maria, CA, I started to work towards a degree in education and substitute taught in California. After a move to Florida, I stepped on the gas teaching 4th through 8th grades. Owning my skill deficits as a teacher of students with severe literacy challenges, I started acquiring degrees and reached out to teacher leaders and master teachers to help me help my students. Eventually earning a doctorates degree with a focus on human capital development, I served my school as a data coach and provided customized professional learning and team leadership for my peers. I was nominated Teacher of the Year at my school. Once "discovered by the district" I then worked with a team of brilliant educators at the district level to design, deliver and evaluate professional learning across the district. ... essential to unlocking a person's potential. I chuckle now, but my first degree was in Broadcast Journalism - and as a political junkie, it's still a career I should pursue. Remember those interviews where you just saw the arm holding the microphone whiling conducting a "man-on-the-street" interview? Well that may have been my arm. I interned with the San Francisco CNN bureau, and loved every bit of learning to write with Greg LaFave, conduct research, interviews for stories, and work long hours with the SF crew during the "Crash of 1988" where I was able to set-up interviews with traders on the CA Options Floor. How'd I manage that? I was a "runner" on the options floor, one of my many college jobs. One of the big surprises and challenges I faced as a new educator was the discovery that most of my students were reading significantly below grade level. Having certified in elementary education, I felt ill-equipped to help my middle school students who were grappling with significant literacy challenges. I endeavored to build my skill and expertise in literacy instruction by acquiring a masters degree in education focusing on special education. In the end, I really improved my skills and impact on students because I deliberately tapped the expertise of master teachers to help me grow and improve. And that's where my passion for professional learning sparked. While raising two daughters and working full time, I went right from my masters degree into my doctoral studies. My thesis focused on studying the impact of professional learning conducted at the district level vs the school level. I used Guskey's professional learning evaluation design to guide my work and I have been hooked on professional learning design and systems thinking ever since. The Bank of America Leadership Academy was a two-year, job-embedded school and district leadership program run by Sarasota County School District, where I first taught, coached, and served as a professional learning leader. My intention at the time was to become a principal with the district and the Bank of America Leadership Academy was a requisite to enter the leadership pool. I will be forever grateful for what I learned in this program and from the women who ran our PD department. It was absolutely transformative in terms of the aquisition and practical application of leadership skills. I'd enjoy the opportunity to connect!